Minnesota couple gives record $500,000 donation in Salvation Army kettle. Salvation Army bell ringer volunteers outside a Giant grocery store November 24, 2012, in Clifton, Virgina. 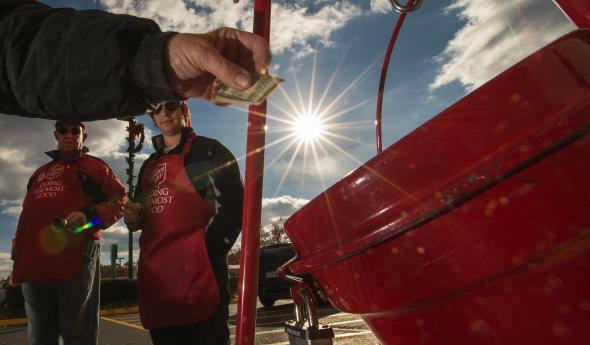 Over the weekend, a Minnesota couple walked up to one of the Salvation Army’s signature red kettles outside a Cub Foods grocery store in suburban Minneapolis and dropped in a headline-grabbing donation—a check for $500,000. The donation far surpasses the previous area record of $25,000 and will seriously skew the curve on the $30 an hour rate the kettles usually take in. In fact, on Tuesday, the Salvation Army confirmed to the Minneapolis Star Tribune that the gift was the largest single kettle donation in the history of the charity. The couple said they made the gift in hopes of encouraging others to also stretch their generosity and to honor one of their fathers, who served in the trenches in World War I and was grateful to the Salvation Army “doughnut lassies” who brought soldiers free coffee and doughnuts. They said they were also inspired by memories from years ago of relying on discarded food from a grocery store to make ends meet.